Wouldn’t it be awesome to be able to change the artwork on display in your home or office with a wave of your hand? Imagine having an entire art gallery at your fingertips and the ability to change the art on display with a wave of your hand. Sounds like a dream, doesn’t it? It isn’t. It’s real. The new Meural Canvas does just that. 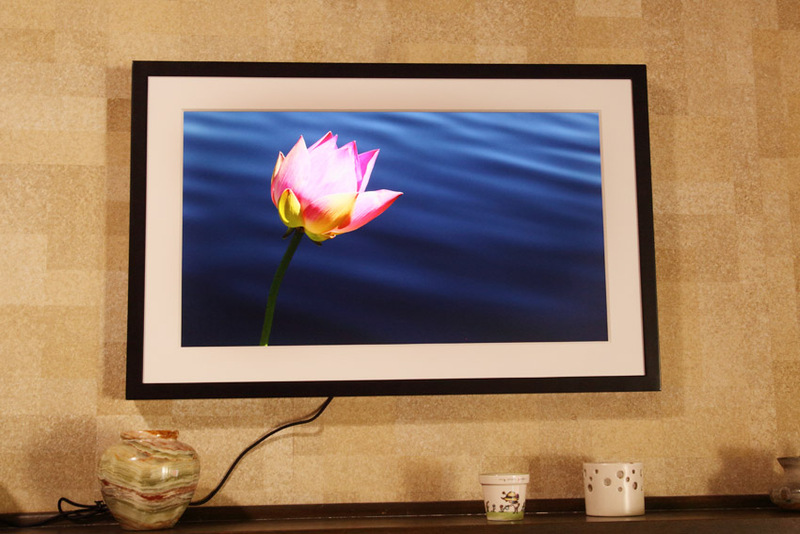 It’s a beautiful new twist on a digital photo frame. It’s available in three styles: white or black wood frames with a white mat, or the Light box style with a light wood frame and a white mat that floats within the frame. The frame is 29 x 18, with a 27” 1080p display with anti-glare technology. Meural sent me one of their canvases to test in exchange for a review. What makes this even cooler is the ability to hang it in either vertical or horizontal orientation, and to change your artwork with a wave of your hand—literally. It is controlled by a gesture sensor that allows you to change images, learn more about the displayed art and access your device settings. It connects via wifi to your phone or desktop computer to make set-up and image loading quick and simple. My canvas came at the perfect time since I’ve pretty much run out of wall space to hang new art. Unfortunately, my first canvas was damaged in shipping, but it was quickly replaced with a perfectly functioning model. Hanging the frame was easy. I just needed a screwdriver, drill and ruler to accompany the provided level and hanging hardware. Because the frame is fairly substantial, following the hanging instructions carefully is vital. Fortunately, it really was easy to hang. You will need to either hang it near an outlet or add an extension cord. Once the frame is up, plug it in and get started. You’ll want to download the Meural app for your phone (android and iphone) and follow the onscreen to connect the frame to your wifi network. I also use my.meural.com on my desktop computer to update and add photos. As a photographer, my own artwork is my first choice. However, if you’re not so fond of your own artwork, the Meural website offers thousands of pieces of art. They offer everything from old masters to contemporary art and photography by both well-known and up-and-coming artists that you can choose from. Although I am tech savvy, I am not exactly coordinated, so it took me a few tries to get the hang of syncing my art to the canvas and working the gesture controls. Now that I’ve figured it out, though, changes and updates are a piece of cake. One important thing to note is that the help files are at meural.com, not my.meural.com, at the bottom of the page under FAQ. Hopefully, in a future update, they’ll add a link on my.meural.com. My canvas has found its home above my fireplace. Ignore my, um, lovely vintage wallpaper, and just notice how perfect it is for displaying art of all types. Who is the Meural Canvas For? 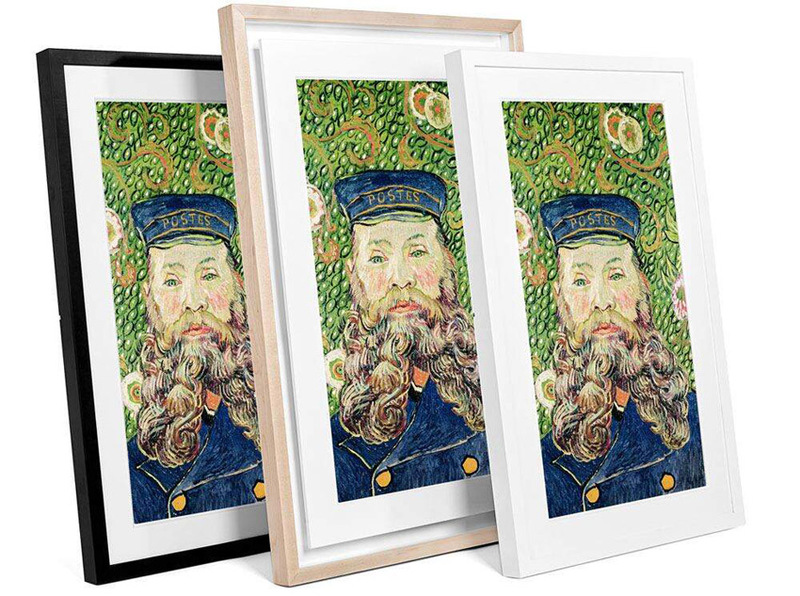 Not only is the Meural great for home display, but it would be an ideal display piece in a business. As a professional photographer, I would definitely have at least a couple of these in my studio to display my favorite works for clients. I could envision displaying this at a wedding reception or other event with a running display of the engagement or bridal portraits. I could also envision using a Meural Canvas in any creative business that wants or needs to display a portfolio for customers. It’s much more elegant and classy than a computer screen or television, and would easily blend with and complement any business decor. Whether you’re a florist, event planner, interior designer, or a myriad of other businesses with products or work to display and highlight, a Meural Canvas would enhance those portfolios. I’m guessing this may be just the tip of the iceberg, and as the Meural Canvas continues to evolve and develop, there will be even more cool reasons to own one. You can purchase your own Meural Canvas here. And yes, if you buy one, I do get a small commission. But don’t let that stop you. You’re going to love the Meural Canvas. So visit Meural today and order yours. And to sweeten the deal a little more, if you add the code MARIE50 at checkout, you’ll save $50 on your purchase.